I worked from October 1979 through January 1981 building Cizek speakers. I never met Roy Cizek but met many people who knew him. Looking at this message board and collection of speaker photos brings back lots of memories. As someone mentioned, the tweeters were mostly from Peerless in Leominster, MA. I was often sent in the company van to pick up loads of tweeters fropm Peerless and bring them back to the plant for assembly. I also remember driving to Nashua, NH to pick up speaker cabinets. Often I would run into a new speaker company just starting out - they were picking up speaker cabinets from the same cabinet maker. The new speaker company was known as Boston Acoustic - I always wonder if they ever made it in the business! We worked at Cizek in the mill in Andover through to the summer of 1980 when the company moved to an old mill building on Canal Street in Lawrence, MA. As someone else mentioned, the President of the Company was driving to work one day and pulled over on Route 93 and died of a massive heart attack. The company suffered after the President (I think his first name was Sheldon) died...apparently he had all the sales contacts in his head. I also remember that Cizek sold a lot of speakers to Italy. I remember filling lots of large metal shipping containers with hundreds of Cizek speakers. The containers were placed on a boat to Italy. Working at Cizek was the first real job I had. I'll never forget working there - especially the long hard days in the summer stuffing the speakers with fiberglass insulation, working with hot melt guns gluing down crossover boards inside the speaker cabinet, and using contact cement to glue on the foam accessories to the outside of the cabinet. Every speaker was 100% tested before it was packed in corrugated. My Dad was Sheldon Feinstein, the President of Cizek. And Yes, he had a heart attack while driving up to work on 128N near Woburn. 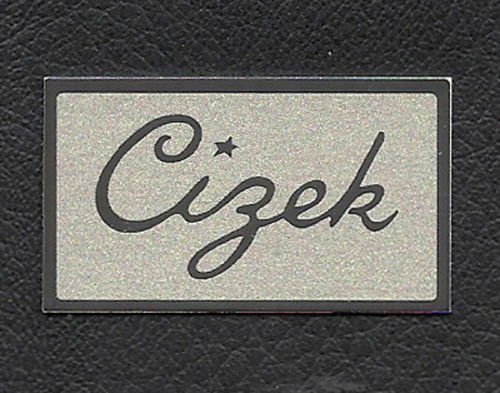 He left for work very early that day (July 1, 1980) because Cizek Audio was about to have their first real Inventory. First in the 5 years of business. My Dad was a great guy. He had such a love for music and good quality reproduction of sound. He certainly was doing something he loved. It is nice to find this forum and for me, relive some pretty cool history. If I remember correctly, the Cizek speakers were quite ahead of it's time due mainly to the crossover circuitry. I would be very interested in hearing from anyone to discuss Cizek Audio, the technology, or anything in general. I worked for Roy and with Ron in Bloomington, Indiana in late 1972. The shop was way out in the country on the west side of town. I was never paid what he owed me. It was, however, a memorable experience. Roy could tell by touch if the veneer was sanded right or not. It drove him crazy when we turned up the radio because he depended a lot on his hearing to navigate the shop (which was unheated in the winter). I stayed for only two or three months but made a couple of good friends while there. Roy's "foreman" (not Ron) built a speaker cabinet with at least a dozen tiny speakers (2 or 3 inch) that somehow sounded really full. I wonder now what the impedance of that thing must have been. I liked the Tower cabinets. They were big, with the three sides with speakers and wide back. When we finished the first set of them I said, "I can see these in somebody's living room with a Coke sitting on top." Roy said he liked the visual image of that. I was there when he bought a big press to use for gluing the veneer to the particle boards with Elmer's glue. We were using contact cement and then smoothing the bubbles with wine bottles one at a time. The bottles were a certain brand that didn't have a seam on the side of them so that the wood wouldn't get marred when it was being rubbed. Roy hoped the white glue and the press would eliminate the smoothing step and speed production. Another memorable moment was when I was driving Roy somewhere in the rain near Curry Pike, and he asked me if the windshield wipers didn’t get in the way of my looking at the road. Those were hard times back then. A lot of people stole stuff from Roy, like a whole van full of 10's that were just purchased and brought back from CTS in Paduca, KY. The guys I worked with at the time and I never took anything from Roy. >brings back lots of memories. >on Canal Street in Lawrence, MA. >of a massive heart attack. >foam accessories to the outside of the cabinet. I too worked for your Dad, I really liked him. I was going to college, ULowell, at the time. He let me use the test equipment to design some of my own speaker systems....later gave papers to the AES, and obtained patents. He encouraged me, and gave me confidence to dive in and engineer. I'll never forget him for that. Yes! I'm Italian, and I have one pair of Mod.1 bought in '79/80 in Turin. I remember there were some shops selling them, sometimes with Cizek passive subwoofer: too high was the cost and too much power needed! But I remember my experience: in a very large store it was possible to compare several type of boxes (U.S.A. and EU)and, even if I had heard Ar, JBL and other kind of loudspeakers, my choice was without dubt Cizek Mod.1. I remember also i have sent my registration card to Cizek in Andover, but my letter returned to the sender...probably the mill was just closed in that days. After about twenty years I have changed all woofer suspension (foam) here in Italy: job was made from Sergio Canini in Livorno (Tuscany), a very experienced person, very able in repairing all old components. Now even if I have changed in my main HiFi Cizek with Sonus Faber Electa Amator, I just have them in a second system, powered by an old Hitachi mosfet amplifier, this plant remember me old times forever gone!! GarryB's post sounds very familiar to me. I too worked for Cizek at Bloomington IN in the early 70's in the old dairy building. The crew used to go to a nearby store for lunch consisting of a couple pounds of ham salad, a loaf of whole wheat bread, and Dr Pepper. There were several dogs and cats that lived in the shop, and slept in old fiberglass. Cizek would play basketball with us by hanging a tweeter with a constant tone feeding it behind the basket rim for location cues. I had purchased a pair of 10 inch Cizek speaker systems from an old college roomate, but had to go work for Cizek to get delivery. Then one Saturday while I was doing some work in the shop alone, someone stole them out of my van. Money was pretty tight. If you wanted to get paid, you generally had to accept payment in speakers and sell them. Officially I was supposed to be making $2/hour, but feel lucky to have collected about half of that in the 9 months I worked there. I made a run to Paducah for a load of 10 inch CTS woofers once, took out a loan to buy them, put them in storage, and sold them to Roy a few at a time as he needed per shop order. I didn't quite break even on that deal, since he couldn't pay for the last 10 or so. I got to help with mill set-up, cabinet gluing and clamping, crossover design, speaker frequency response testing with the B&K analyzers, etc. It was certainly an exciting time. Once one of the cabinet crew freaked out on acid and we had to take him home for his own safety. Another time the crew worked on restoration of Cizek's house, which had been damaged by a fire while he was renting it to college students. I think I have a brochure from the speakers I originally bought that were stolen. If I find it I'll try to send it for posting. Yep. I lived in Ballardvale and visited Cizek a few times when it was on Stevens St. in Andover, MA. I remember Sheldon. I also remember getting my first introduction to the idea of a subwoofer. Well, fast forward to today and look what happened. I never saw or even heard of Roy Cizek speakers until I came to this site. From the several writings previously it appears that Roy Cizek was not a very good businessman at all. He was a brilliant designer, as I read, but should have really worked with someone who could finance his operation. There was and is a lot of brilliant people with outstanding ideas and they need money for startup and ongoing expenses until the tide changes and there is a profit. Of the few writings from mostly Italian members, Paolo in particular, there is a great love of Roy's products and a super strong brand loyalty. Paolo, I believe, posted a photo of a small Cizek speaker, which to me looked like a high-end mini-monitor of today. The cabinetry is exquisite and even if it was a stock photo, I was drooling. When Ultrawood collapsed, I ended up keeping all the lab equipment but of course I do not have it any more (Maranz pre amp, phase linear amp, AR LST's advents bose's etc... and lots of Cizek prototypes. I just found a pair of Model 1 on craigslist and will be refurbishing them for memory sake...Liklihood is that I may have built the cabinets. i'm Sergio from Italy owner since 1982 of a pair of Model 3 and it's a pleasure to have a chance to meet here the people who provide these great and unique speakers. I'm interested now to receive informations concerning the customize process (by Cizek factory) of the great tweeter Peerless KO10DT/8 or DT115 before the installation in the cabinet. Thats because i have two spare pairs of tweeter that i bought many years ago from Coral (Peerless italian dealer) and II would like to setup these spare parts as a real backup of the original piece moodified by Cizek. Any info about that can be really useful. I also worked for Roy and with Ronnie and some guys the summer of 72. Yes, this was on Highway 45 west of Bloomington in the old dairy building. I can confirm that the work and pay schedule was spotty. The product was good. We glued the walnut veneer to the particle board boxes and smoothed out the bubbles with wine bottles. I think I built some cross-overs, ran the saws and the routers some, and worked with Roy on the scope outputs in design or build phase. But I mostly did the final assembly - gluing and clamping the boxes, setting the cones, stretching and gluing fabric grill cloth, wiring and soldering and so forth. That summer we built a sound booth and hauled it up to McCormick place for a national CE show. It looked like a little log cabin in the midst of the neon and glitz in that gigantic hall. I remember building a pair a huge 3-way boxes each with a pair of 12" woofers, midrange pair and dome tweeter pair. That pair we placed in the IU school of music in a smallish performance room if I truly recall. We built a lot of big ported boxes and a lot of tight bookshelf units. I lost track of the product and the brand, but I've used some of the learned skills tinkering with my own stuff from time to time. Don't know how I missed this thread. I've become a fan of Cizek speakers and have KA-1s in my living room and rec room, and HTAs as rear speakers in the living room. A question for those of you who worked for Roy Cizek: How did he pronounce his name? I've been saying CHI-zek but have heard people say CI-zek (rhymes with physic) and even SIGH-zek. So what's right? I correct people who mispronounce Henry Kloss (it's "close" as in It's not perfect, but it's Kloss) so I want to pronounce Mr. Cizek's name correctly. A belated "welcome" to you new members! Just stumbled onto this page and have really been enjoying the posts. Especially the posts from GarryB, TWKRIN, and KFOM. I grew up in Bloomington IN and owned a pair of Cizek (in typical Indiana drawl we pronounced them as SEE ZAK) speakers in the early 70's. I think I was 16 or 17 when I bought my speakers at a local stereo shop. The first new speakers I'd ever owned. I'm pretty sure they were the 10" two ways (don't remember the size of the tweeters) and I don't think I paid over $I00 new for the pair. I don't even remember them having model numbers at the time. I definitely remember they weighed a LOT. They did look a lot like AR-3s with very thin white grill cloth. You saw a lot of their speakers in Bloomington at that time as they were the best you could get for the money. I met Roy and Ronnie when I was working at The Guitar Gallery on Kirkwood. They came into the store occasionally as all of the "hippies" hung out around there on Kirkwood. I also met them again when I had a problem with one of the speakers and I hand carried them back to their factory for repair. At that time the "factory" was located on Walnut street right across from The Penguin. They did move around a lot and it was always pretty much known that they always had trouble paying the bills. I remember going there two or three times to make sure I got my speakers back. I also remember that in my dealings with them Roy communicated with the public through Ron? Roy would say what he wanted to in a very soft tone and then Ron would repeat it at a level you could hear. At that time they didn't have any administrative staff that I saw. I left Bloomington in 1978 and unfortunately my speakers didn't leave with me. I was always surprised to hear how successful they'd become after leaving IN. Cool to have them associated with my hometown. its been a fun journey searching and learning what I can about Mr. Cizek! It was recommended that I try to contact some of you guys as former employees about this set. If you have a chance, perhaps you would check out the thread with the pics and shed some light on these gems that I've found? I sincerely appreciate any info that you can bring to the table. Brian - thanks for posting the pics of the 8" 2-way. I assembled a lot of those in 1972. The missing cover was of brown or black, probably brown, burlap material stretched and glued over a fitted masonite frame. The backside of the frame had the velcro tabs as well. I believe that the front ridge of the box was solid dark 1/2"x1/2" (more or less) good wood that was glued over the flush particle board front and panel edges. Then we glued the matching veneer over those pieces and that covered the seam. Seamless wine bottles were employed to press the veneer. I think I have this right but others may recall other details. It was a tight box, great sound. What I don't recall is the tunable hi-freq control on the terminal board. That may have been a upgrade from what I worked on. I just don't recall that configuration. Thanks so much for that info Brett! I do indeed have the covers, I hope the other pics came through on the other thread, I'll go check. I did Just have to recover them. I think I found a Pretty close match for the fabric. The wood is still in prettty good condition also. Shined right up with a little oil action. Hi Briant* and a belated welcome! I do not believe yours are any kind of "prototype" as was suggested on the other forum. What what I can gather, mainly from this site http://cizekspeaker.weebly.com/ there were 3 Cizek companies. I gather Mr. Cizek was a better audio engineer than businessman and he may have been a couple of steps ahead of bill collectors. I don't know. Cizek Enterprises came first. That was the Bloomington site. Your speakers are rare and, I would think collectible early speakers. Next was Cizek Audio Systems in MA, making the famous Model 1, Sound windows, KA-1 and others. In my home theater I use a pair of beautiful KA-1s as the front speakers and a pair of nice flat High Tech Aspirins in the rear. Both were made of solid wood. The KA-1s are rare Hawaiian koa and the HTAs are solid oak. I think Mr. Cizek, although blind, appreciated the beauty of solid wood. In that respect the Sound Windows are a little disappointing because they were wood-grained urethane plastic. Would you do me the favor of measuring the badges on yours and telling me the color scheme and material? They look like black on gold. I have some reproductions of the HTA badges that look virtually identical but they are silver. 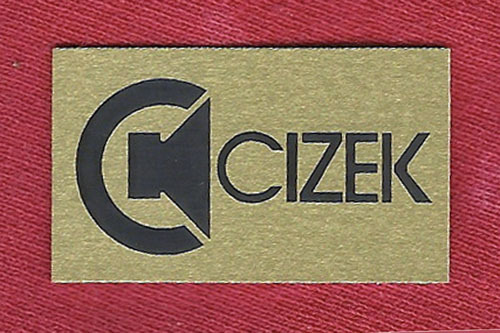 I also have reproductions of the Cizek Audio Systems badges, which were quite different. the badges are made of metal and are brown and silver in color. The posts on the rear are threaded and secured with a simple hex-nut. They measure 1-5/8" x 7/8"
Thank you! That's the size of the black-on-silver ones I have. So I know I am on a year old thread but I just found out a guy that lives back behind my warehouse used to work for Roy. His name is Lenny Plotkin and he wired the x-overs and worked on the woofers some of you undoubtedly know him. He spoke very highly of Sheldon and well Roy not so much. I just got two MG27 subwoofers from him unfortunately only two drivers between the two boxes but also 3 sets of model 1 Cizeks and a pile of peerless tweeters. I saw a few old photos of him working in the shop I will ask him if I can scan them and share with all of you if you are interested. Lenny is crazy as ever and still happily married to Phyllis. Hey Thrift-flea, that was a great first post, welcome aboard. 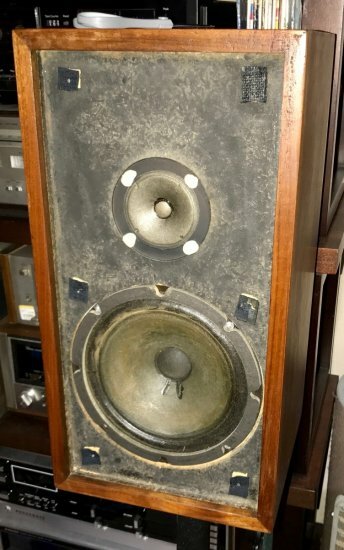 Although I cannot claim to know Sheldon or Phyllis or Lenny or Roy, I certainly did know Bloomington in the early 70's, and this idea that Cizek speakers originated there and then is something that escaped me at that time but does interest me today.